Thursday night saw just 2 New York Islander prospects see action and in their own way, it was a study in contrasts. Both are defensemen, both are captains on their respective teams but that is what the comparisons end. Griffin Reinhart (NYI 2012 1st) is the captain of the Edmonton Oil Kings, he camethisclose to sticking with the Islanders this season and he has everything going for him as in the case with most 1st round draft picks. Reinhart is a lock for Hockey Canada's Under-20 team and just might be their captain as well. 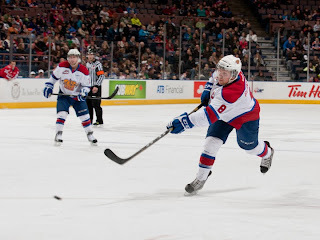 Reinhart has won a WHL championship, played in a Memorial Cup and twice played in the WHL finals. He is one of the best young defensemen that Canada has produced and will be a mainstay in the Islander lineup when he eventually makes the team. For now he is leading his Edmonton Oil Kings to wins like the one they had against the Moose Jaw Warriors on Thursday evening when they spotted Moose Jaw a 1-0 lead and roared right back earning a 6-2. It was Edmonton's first home game in 24 days and the Oil Kings made the most of being home. The first star of the game, Reinhart was a 1-2-3 scoring Edmonton's 1st goal of the game and then adding 2 secondary assists to help Edmonton move into 3rd place in the WHL's Eastern Conference and just 3 points behind 2nd place Medicine Hat. With Moose Jaw already up 1-0, Reinhart blasted a point shot in at 16:38 to tie the score. It was Reinhart's 2nd goal of the season but he wasn't finished as Reinhart would add 2 secondary assists on Edmonton's 2nd and 4th goals of the game. Edmonton wins as Reinhart has his 3rd three point game of his WHL career and improves on the season to 2-7-9. Edmonton wins for the 8th time in their last 10 games. The flip side is defenseman Jesse Graham (NYI 2012 6th) and his Niagara IceDogs who are in a "rebuilding mode." You might as well say guaranteed losing season as the IceDogs are heading in the opposite direction of the Oil Kings. The IceDogs dropped an 8-4 decision to the Sault Ste. Marie Greyhounds for their 3rd straight loss and 8th in their last 10 games. The IceDogs have the 4th worst record in the OHL and for someone like Graham who is the captain of the IceDogs, it hurts his chances at earning an offer from the Islanders. Graham as it is happens to be a lower round pick so unlike Reinhart who was pretty much a lock for a NHL deal, Graham has no contract and odds are won't get one unless Graham and his team have a drastic turnaround. That sadly does not look like it has a chance of happening. Penn State was in action on Thursday but Eamon McAdam (NYI 2013 3rd) was "Did not play" as his Penn State Nittnay Lions lost to UMass Lowell 4-0.